Remember back to your high school days when you had to write that pesky research paper? Or maybe you’re still in high school and you have a history assignment due. It can be a long process combing through dozens of books to find useful information; and in today’s age of widespread digital information, it can be even trickier finding credible sources. You probably recall the distinction between primary and secondary source materials, yes? As a refresher, primary sources are any sort of information gathered at the time in question, for example: a diary recalling a day’s activities, a log of monthly temperatures, or a city directory listing residents’ mailing addresses. The information contained in these sources were all produced during the time of study. That’s not to say these can’t contain errors- the diary writer could have miswritten or misremembered a detail, the thermometer could have been improperly calibrated, and the directory could contain a typo. That said, the general rule is, the closer the recording is to the time in question, the more accurate the recording is likely to be. Secondary sources are of a different nature; they are recorded after-the-fact and often include analysis, commentary and interpretation, for example: a 21st century scholar’s history of Roman England. Some secondary sources can be thoroughly researched and extremely reliable, whereas others might be intentionally biased- say a Nazi sympathizer misrepresenting fact to persuade his/her reader. 1972.01.0486, City of Greeley Museums, Permanent Collection. 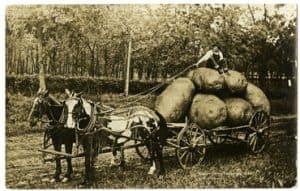 Here’s a photo of a man sitting atop 6 gigantic potatoes- are we to believe crops grew that much better at the time this image was shot? Of course not! Take a closer look and you’ll notice the tiny white cut lines bordering the man and the potatoes. This image is actually a composite of multiple images produced by a crafty trickster- call it the earliest version of photoshop! In a less comical example of misleading information, take David Boyd’s A History: Greeley and the Union Colony of Colorado. This book, written in 1890, offers great insight on early life in this region; however, because Mr. Boyd could not be everywhere at once, and because he was writing decades after some events occurred, mistakes are almost inevitable. For example, Boyd states Nathan Meeker, the founder of Greeley, was born in 1814. A minor mistake, yes, but as misinformation is passed down over the years, the trickier it can be to uncover the truth. 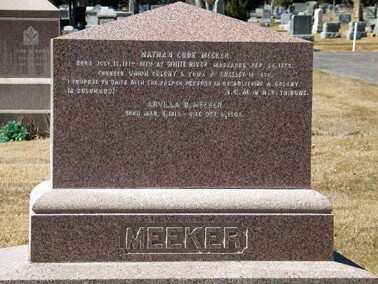 Nathan Meeker’s tombstone in Linn Grove Cemetery, Greeley, Colorado. One would think that a tombstone accurately reflects the birth and death dates of the deceased, but again, one can be fooled! Nathan Meeker was killed at the White River Agency on September 29, 1879. His body was transported back to Greeley a year later, arriving on September 30, 1880, at which time he was buried in Linn Grove Cemetery in a lot donated by the community, but with no tombstone. In October of 1881, a solicitation for donations for a monument to Meeker in Lincoln Park was printed in the Tribune; however, the town failed to raise the specified amount and the matter was forgotten. Becoming so disheartened by her husband’s unmarked grave, Arvilla Meeker finally commissioned a monument on her own accord in 1890 costing her $525. So a tombstone was erected over 11 years after Meeker’s death, then a new stone (copying the original inscription) replaced it decades later as the old stone began to disintegrate. But surely when commissioning the original marker Nathan’s own wife would get the year of his birth correctly. Or would she? At the time of Nathan and Arvilla’s marriage, it was fairly uncommon for a woman to marry a younger man. Even though she was only a little over two years older than Nathan, Arvilla did not wish to publicize this information. It’s not unlikely that she intentionally marked Nathan’s tombstone with an incorrect birth year of 1814 rather than 1817, so as to avoid public speculation. What’s more, many newspaper obituaries from the years following Nathan’s death also misstate his birth year, using bad information as it was passed from one source to another. So how can we ever know what is accurate? The key is to look to as many primary sources as possible to confirm a fact. We turned to official census records, diary entries, and correspondence to verify that Nathan Meeker was in fact born in 1817. The take away here is, the more primary source information you can dig up, the better picture you’ll gain. We at the Greeley History Museum love history and researching. If you’ve ever offered to donate something to the museum, you’ll know that we ask a lot of questions about the ownership and life-history of the object so that we can avoid making assumptions. These details, along with our own research, help to put the object into context and make it come to life. Similarly, staff at the Museum’s Hazel E. Johnson Research Center is dedicated to helping you in your research needs, providing you access to the City’s wealth of primary and secondary resources. Come on by and let’s wade though the immense, and sometimes baffling, historical record together! The Hazel E. Johnson Research Center is open Wednesdays-Saturdays, 10am-4pm. Click here for more information.